This desirable and most attractive end of terrace home was built approx. 12 years ago built in keeping with the neighbouring Victorian style properties. This home provides light and spacious accommodation with a modern and stylish interior. To the ground floor accessed from the entrance hallway is the delightful lounge with bay window, bespoke radiator covers and large walk in storage cupboard. Also off the hallway is a wonderful Kitchen/Breakfast room with integrated appliances, space for table and chairs and double doors accessing the sunny Rear Garden. 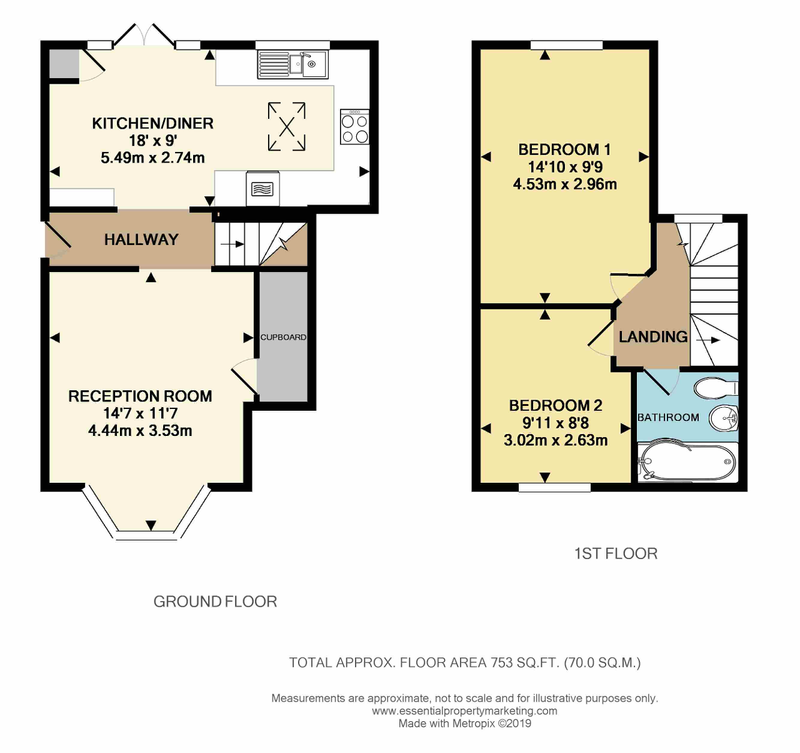 To the first floor are the 2 Bedrooms the Master Bedroom benefiting from fitted wardrobes and separately off the landing is a superb Bathroom. The loft space is fully boarded with power and accessed via a ladder, providing great additional storage space. Externally there is a well tended Rear Garden of a Southerly orientation enjoying a gated side access, decked area and astro-turf lawn for ease of maintenance making a great space for summer bar-be-cues. A garden shed is also to remain providing further storage. To the front of the property is a Private DRIVEWAY providing Off Street Parking, rarely found and a great asset for those looking to be within walking distance of the vibrant Warlingham Village Green. This beautiful home is a rare find and an EARLY INTERNAL VIEWING IS HIGHLY RECOMMENDED. Glebe Road is a small no through road located immedately off Warlingham Village Green which offers an array of boutique style shops, coffee outlets and restaurant facilities. Upper Warlingham Station is approx. half a mile away and the 403 bus passes by on the village green. The area is well served with a selection of reputable schools for children of all ages. This delightful home is situated on a level plot within walking distance of all facilities making this an ideal purchase for all age groups whether being a first time buyer or those looking to downsize.